You’ve now officially mastered the nappy changes and your little one is finally sleeping through the night. With a small person that’s always on the go and gets into everything, the thought of holidaying abroad may seem overwhelming. How will you keep them occupied on the plane? Or at nice restaurants? Yet, a family holiday provides the perfect change of scenery. Plus, there are a number of fantastic destinations in the UK, Europe and further afield that offer plenty of fun for the whole family. 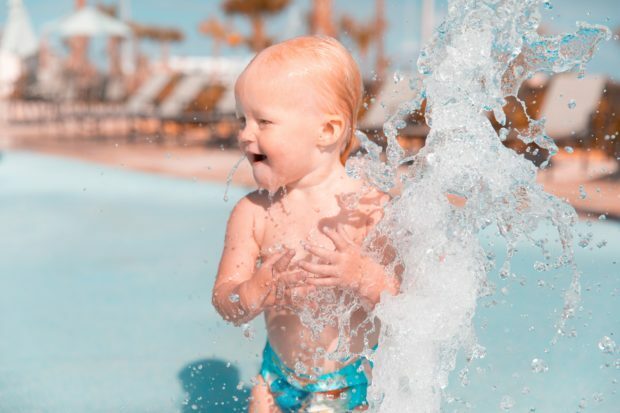 We think it’s time for a well deserved trip away and to make planning a luxury toddler-friendly holiday, easier we’ve put together this handy guide. It includes some of our favourite destinations, hotels and attractions perfect for children under three. Copenhagen is perhaps one of the most loveable family-friendly cities in Europe. Here, you’ll find one of Northern Europe’s largest aquariums, a world-class zoo, and plenty of parks perfect for helping your toddler burn off their extra energy. It’s an easy city to get around with excellent transport links and most attractions within easy walking distance of the city centre. Throughout the city, you’ll find that many restaurants provide high chairs and serve international food making it possible to satisfy even the fussiest eater. Copenhagen has the perfect mix of culturally rich and children oriented sites, making it a top luxury holiday destination for families with toddlers. Copenhagen Zoo. Open since 1859, Copenhagen Zoo will keep the kids entertained for hours. Today it’s home to over 3,000 animals so kids can see all of their favourites like pandas, penguins and more. There are also a number of children events on throughout the day. The Blue Planet. As Northern Europe’s largest aquarium, The Blue Planet has over 53 exhibits as well as a water playground and beautiful cafe with views over the water. You could easily spend a pleasant day here meeting the 20,000 animals that live here. Tivoli. Both adults and kids will delight in a visit to the world’s oldest amusement park. Tivoli has lush flower gardens, perfect for allowing toddlers to practice their walking skills. There’s also plenty of playground areas, cafes for mom & dad, and even free-roaming peacocks. Radisson Collection Royal Hotel. Located within easy walking distance of Tivoli Gardens and Copenhagen Central Station, this five-star hotel is a popular choice for young families. They offer family rooms as well as suites, which are perfect for making sure you don’t need to sleep with a little person in your bed! Hotel Sanders. For a truly elegant holiday, stay at Hotel Sanders a boutique hotel located in the heart of Copenhagen. It features a rooftop conservatory garden, perfect for burning off excess energy, and offers family rooms and apartments. Nimb Hotel. 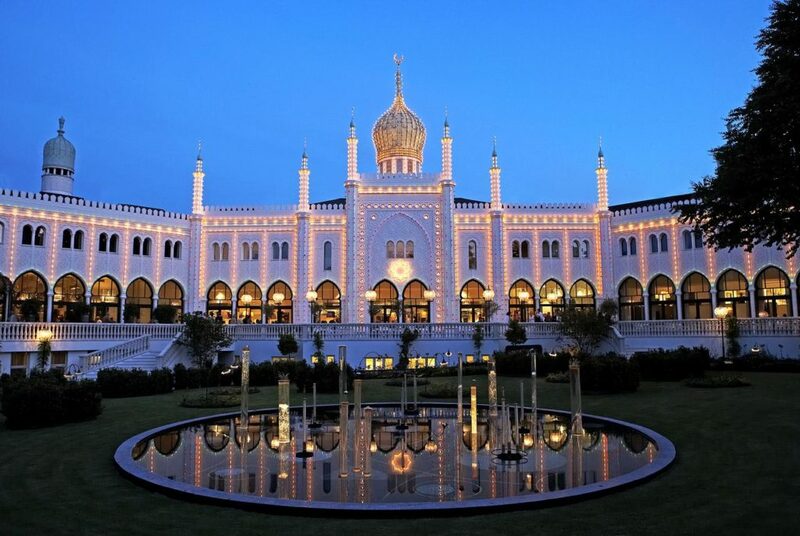 Situated within Tivoli Gardens, Nimb Hotel has one of the best locations in Copenhagen. With direct access to an expansive play area and onsite swimming pool, this five-star hotel is a fantastic choice for families with toddlers. Like most of Continental Europe, Copenhagen has warm summers and cold, snowy winters. We recommend travelling during the summer as temperatures remain pleasant with highs of 22 degrees Celsius and plenty of sunshine. During the summer, the city is alive with people picnicking in the park, markets take over central squares and there are also many cultural events. Think that escaping to a tropical paradise is impossible after becoming a parent? Think again. The Bahamas are a super family-friendly destination with many hotels offering kids clubs, creches and even babysitting services. There’s also plenty of activities for young kids to enjoy from building sandcastles to taking their first wobbly steps on pristine white beaches. This is one destination that adults and kids alike will love! Nassau & Paradise Island. As the capital of the Bahamas, Nassau has many fantastic museums, including the Children’s Museum of the East End, as well as restaurants serving kids’ favourite meals. Of course, Paradise Island, as the name would suggest, also has plenty of beautiful beaches and stunning nature. Grand Bahama Island. Known for its fantastic beaches, Grand Bahama Island is one of the best places for young children. There are tons of opportunities for outdoor adventures and even a kid-friendly marketplace. Eleuthera. With its shallow bays and stunning beaches, Eleuthera is another fantastic choice for a family holiday. You can picnic on secluded beaches, go on a camping safari and much more. The Bahamas has many fantastic high-end hotels that cater to young children with kids clubs, creches and even babysitting services available. Many have onsite facilities, like fun splash pools, playgrounds and other kid-friendly attractions, that make entertaining wee ones easy. The Ocean Club, a Four Season Resort. A fantastic choice for young families, The Ocean Club provides everything you need for a luxury holiday. You’ll have direct access to the beach and can book king suites to make sure there’s enough room for everyone. Other perks include a babysitting service, playground, and kids club. The Royal At Atlantis. Known across the world for its magical aquarium, The Atlantis, located on Paradise Island, is one of the best places to stay in the Bahamas with a toddler. 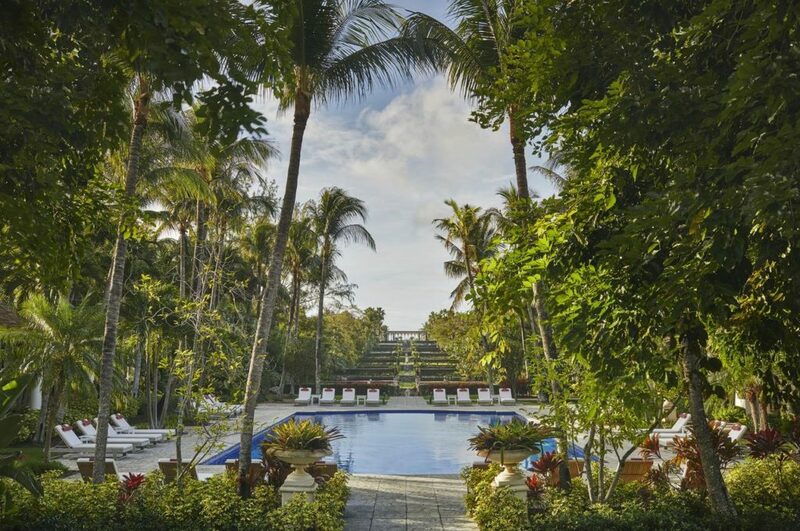 With 37 acres of waterfalls, gold sand beaches and lagoons, there’s plenty of areas to explore. The hotel also provides family rooms, room babysitting and a great kids club. Tiamo Resort. Guests at Tiamo Resort benefit from a stunning private beach. Families with young kids will particularly enjoy the option to stay in a villa with a private pool. There’s also a babysitting service, soundproof and family rooms, and a shuttle service. The Bahamas are a fantastic family-friendly destination year-round. Temperatures remain relatively consistent throughout the year with colder months (December to April) experiencing lows of 21 degrees Celsius and warmer months (June to September) reaching highs of 26 degrees Celsius. Hotels can get especially busy around Christmas and Easter so if you plan to travel during this period make sure to book ahead. Despite being one of the biggest cities in the UK, London is also a fantastic place for a family-friendly holiday. There’s plenty of attractions that cater specifically to small children and nearly every restaurant has high-chairs available. Almost every neighbourhood has local playgrounds and parks too! A word of warning: London’s tube system can get very busy during rush hour and isn’t ideal for prams or pushchairs. London Transport Museum. What toddler doesn’t love cars and firetrucks? The London Transport Museum caters to toddlers’ fascination with public transport and even includes a fun All Aboard family play zone, where toddlers can drive a real bus! Tumbling Bay Playground. Located in Queen Elizabeth Olympic Park, Tumbling Bay Playground is the perfect place for toddlers to practice their climbing skills. They can explore sandpits and rock pools, zip down slides and fly on the swings. There’s also a cafe here for an afternoon snack and coffee for mom and dad. V&A Museum of Childhood. Designed specifically for children, the V&A Museum of Childhood offers regular storytelling sessions, treasure hunts and much more. Kids of all ages will enjoy the exhibits featuring their favourite childhood toys like teddy bears and doll houses. As the UK’s largest city, London has plenty of excellent family-friendly hotels. We recommend picking a hotel nearby key sites to avoid having to travel long distances on public transport. Neighbourhoods like the West End, Piccadilly Circus, Hyde Park and South Kensington are excellent choices. The Athenaeum. Located in Mayfair and within walking distance of Buckingham Palace, The Athenaeum is a fantastic five-star hotel that caters specifically to young children. They offer a kids’ concierge service which will help you arrange tickets, family-friendly restaurant reservations and even help you create an itinerary to suit your kids’ interests. They’ll also stock your room with your kids’ favourite books, TV shows and food. The Nadler. Voted best family hotel by TripAdvisor in 2011, the Nadler is another great choice for those travelling with young children. They have two London locations: one in Kensington and one in Soho. The Kensington location has bunk rooms for families with more than one child and cots are available on request. Every room has practical mini-kitchens so you can make late night snacks or warm cups of milk. VI Castle Lane. Located within easy walking distance of Buckingham Palace and offering a private garden, VI Castle Lane is fantastic for young children. You can rent apartments with multiple bedrooms to give you more room during your stay. They also offer a babysitting service for a much-needed break. London’s temperature remains relatively mild throughout the year. Even during the wettest months (December to March), there are plenty of indoor attractions to keep young children entertained. During warmer months, the city comes alive with outdoor events and parks are an excellent place to spend an afternoon. With so much to do whatever the weather, London is a fantastic year-round destination for those travelling with young children.